listen); Choctaw: Itta Homma; "red stick") is the capital of the American State of Louisiana. Located in East Baton Rouge Parish, the city is the second largest in the state, and has a population of 229,553 people as of the 2010 census. The metropolitan area surrounding the city, known as Greater Baton Rouge, has a population of 802,484 people as of 2010. The urban area has around 450,000 inhabitants . From evidence found along the Mississippi, Comite, and Amite rivers, and in three Native American mounds remaining in the city, archaeologists have been able to date indigenous habitation of the Baton Rouge area to 8000 BC. The mounds were built by hunter-gatherer societies in the Middle Archaic period, perhaps as early as 4500 BC, more than a thousand years before the pyramids of Egypt were begun. The settlement of Baton Rouge by Europeans began in 1719 when Baton Rouge was established as a military post by the French. During the French colonial period, most settlement and agricultural development was concentrated in the area of New Orleans, which became a port for the colony. Since European settlement, Baton Rouge has been governed by France, Britain, Spain, Louisiana, the Florida Republic, the Confederate States, and the United States. In 1755, when French-speaking settlers of Acadia in Canada's Maritime were driven into exile by British forces, many took up residence in rural Louisiana. Popularly known as Cajuns, the descendants of the Acadians maintained a separate culture that immeasurably enriched the Baton Rouge area. During the first half of the 19th century, the city grew steadily as the result of steamboat trade and transportation. Incorporated in 1817, Baton Rouge became Louisiana's state capital in 1849. The architect James Dakin was hired to design the Capitol building in Baton Rouge. Rather than mimic the federal Capitol in Washington, as many other states had done, he designed a Neo-Gothic medieval cathedral, complete with turrets and crenellations, and stained glass, which overlooks the Mississippi. It has been described as the "most distinguished example of Gothic Revival" architecture in the state. By the outbreak of the Civil War, the population of Baton Rouge was 5,500. The war halted economic progress and the Union Army occupied Baton Rouge in the spring of 1862. The Confederates at first consolidated their forces elsewhere, during which time the state government was moved to Opelousas and later Shreveport. In the summer of 1862, about 2,600 Confederate troops under generals John C. Breckinridge (the former Vice President of the United States) and Daniel Ruggles attempted in vain to recpature Baton Rouge. After the war, New Orleans served as the seat of the Reconstruction-era state government. When the Bourbon Democrats regained power in 1882, they returned the state government to Baton Rouge, where it has since remained. Karl Baedeker in his 1893 guidebook described Baton Rouge as "the Capital of Louisiana, a quaint old place with 10,378 inhabitants, on a bluff above the Mississippi." In the 1950s and 1960s, Baton Rouge experienced a boom in the petrochemical industry, causing the city to expand away from the original center. In recent years, government and business have begun a move back to the central district. A building boom that began in the 1990s continues today, with multi-million dollar projects for quality of life improvements and new construction happening all over the city. In the 2000s (decade), Baton Rouge has proven to be one of the fastest-growing cities in the South in terms of technology. Baton Rouge's population temporarily exploded after Hurricane Katrina, as it accepted as many as 200,000 displaced residents. Metropolitan Baton Rouge is one of the fastest growing metropolitan areas in the U.S. (under 1 million), with 602,894 in 2000 and 802,484 people as of the 2010 census. Some estimates indicate that the Baton Rouge metro area could reach 900,000 residents as soon as 2013. The city has a mix of the cultures found throughout Louisiana, from which it developed its motto: "Authentic Louisiana at every turn". Baton Rouge is located at 30°27′29″N 91°8′25″W﻿ / ﻿30.45806, -91.14028 (30.45, −91.14) on the banks of the Mississippi River in Southeastern Louisiana. According to the United States Census Bureau, the city has a total area of 79.1 square miles (204.9 km2), of which 76.8 square miles (198.9 km2) is land and 2.2 square miles (5.7 km2) (2.81%) is water. The city is located in the Mississippi River Delta on the first set of bluffs north of the delta's coastal plains. Because of its prominent location along the river and on the bluffs, which prevents flooding, the French built a fort in the city in 1719. Baton Rouge is the third southmost capital city in the continental United States, after Austin, Texas and Tallahassee, Florida. The yearly average temperature for Baton Rouge is 67.5°F (19.7°C) while the average temperature for January is 51.21°F (10.67°C) and August is 80.54°F (26.97°C). The area is usually free from extremes in temperature with some cold winter fronts but those are usually brief. Baton Rouge's proximity to the coastline exposes the metropolitan region to hurricanes. On September 1, 2008, Hurricane Gustav struck the city and would become the worst hurricane ever to hit the Baton Rouge area. Winds topped 100 mph (160 km/h), knocking down trees and powerlines and making roads impassable. The roofs of many buildings suffered tree damage, especially in the Highland Road, Garden District, and Goodwood areas. The city was shut down for five days and a curfew was put in effect. Rooftop shingles were ripped off, signs blown down, and minor structural damage occurred. Baton Rouge enjoys a strong economy that has helped the city be ranked as one of the "Top 10 Places for Young Adults" in 2010 by Portfolio Magazine and one of the top 20 cities in North America for economic strength by Brookings. In 2009, the city was ranked as the 9th best place in the country to start a new business by CNN. The city is home to one Fortune 500 company and one Fortune 1000 company, including Shaw Group. Lamar Advertising Company has its headquarters in Baton Rouge. Baton Rouge is the farthest inland port on the Mississippi River that can accommodate ocean-going tankers and cargo carriers. The ships transfer their cargo (grain, crude, cars, containers) at Baton Rouge onto rails and pipelines (to travel east-west) or barges (to travel north). Deep-draft vessels cannot pass the Old Huey Long Bridge because the clearance is insufficient, and the river depth decreases significantly just to the north, near Port Hudson. Baton Rouge's largest industry is petrochemical production and manufacturing. The ExxonMobil facility in Baton Rouge is the second-largest oil refinery in the country; it is among the world's 10 largest. Baton Rouge also has rail, highway, pipeline, and deep water access. Albemarle is headquartered in Baton Rouge. Dow Chemical Company has a large plant in Iberville Parish near Plaquemine. NanYa Technology Corporation has a large facility in North Baton Rouge that makes PVC and CPVC pipes. Shaw Construction, Turner, and Harmony all started with performing construction work at these plants. As well as being the state capital and parish seat, the city is also the home of Louisiana State University. One of the largest single employers in Baton Rouge is the state government, which recently consolidated all branches of state government downtown at the "Capitol Park" complex. The research hospitals Our Lady of the Lake, Our Lady of the Lake Children's Hospital (affiliated with St. Jude Children's Research Hospital), Mary Bird Perkins Cancer Center, and Earl K. Long, helped by an emerging medical corridor at Essen Lane/Summa Avenue/Bluebonnet Boulevard, are positioning Baton Rouge to eventually support a medical district similar to the Texas Medical Center. LSU and Tulane have both announced plans to construct satellite medical campuses in Baton Rouge to partner with Our Lady of the Lake Medical Center and Baton Rouge General Medical Center, respectively. Southeastern Louisiana University and Our Lady of the Lake College both have nursing schools in the medical district off Essen Lane. Louisiana State University's Pennington Biomedical Research Center, which conducts clinical and biological research, also contributes to research-related employment in the area around the Baton Rouge medical district. The film industry, like in neighboring New Orleans, is a strong growth industry in Baton Rouge, which is now home to a new and expanding movie studio known as Celtic Media Center. Numerous films and movies are filmed in the Baton Rouge area every year. Because of generous state tax credits, there has been significant development in post production facilities and movie studios in the region. Of all households, 28.1% had children under the age of 18 living with them, 35.8% were married couples living together, 19.0% had a female householder with no husband present, and 40.8% were non-families. 31.7% of all households were made up of individuals and 8.6% had someone living alone who was 65 years of age or older. The average household size was 2.42 and the average family size was 3.12. In the city the population was spread out with 24.4% under the age of 18, 17.5% from 18 to 24, 27.2% from 25 to 44, 19.4% from 45 to 64, and 11.4% who were 65 years of age or older. The median age was 30 years. For every 100 females there were 90.5 males. For every 100 females age 18 and over, there were 86.3 males. 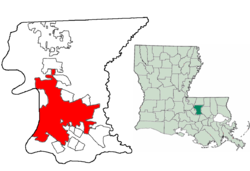 The City of Baton Rouge and the Parish of East Baton Rouge has been run by a consolidated government since 1947, which combined the City of Baton Rouge government with the rural areas of the parish. The City and Parish are served by the Metropolitan Council and the Mayor-President. BRgov.com is the official government website for the City of Baton Rouge and the Parish of East Baton Rouge. The Mayor-President is the Mayor of the City of Baton Rouge and the President of East Baton Rouge Parish. The Mayor-President's duties include setting the agenda for the government and managing the government's day-to-day functions. He is also responsible for supervising departments, as well as appointing the department heads. The Mayor is unable to set the city's public policy because that is the role of the Metropolitan Council. However, the Mayor-President does have some influence on the public policy by who he appoints and his relationships with Council members. The current Mayor-President of Baton Rouge is Kip Holden. He was first elected in 2004 and was re-elected in 2008 and 2012. When the city and parish combined government, the city and parish councils consolidated to form the East Baton Rouge Parish Metropolitan Council. The Metro Council is made up of 12 district council members with one member being elected to serve as Mayor Pro Tempore. The Metro Council is the legislative branch of the City of Baton Rouge and East Baton Rouge Parish. The Mayor Pro Tem presides over the council's meetings and acts as the Mayor-President if he/she is unable to be present. The council members serve four year terms and can hold office for three terms. The Metro Council's main responsibilities are setting the policy for the government, passing legislation and approving the city's budget. The Council makes policies for the following: the City and Parish General Funds, all districts created by the Council, the Greater Baton Rouge Airport District, the Public Transportation Commission, the East Baton Rouge Parish Sewerage Control Commission and the Greater Baton Rouge Parking Authority. The current council members are Mayor Pro Tempore Chandler Loupe, Trae Welch, Chauna Banks-Daniel, Scott Wilson, Ronnie Edwards, Donna Collins-Lewis, C. Denise Marcelle, Buddy Amoroso, Joel Boé, Tara Wicker, Ryan Heck, John Delgado. The United States Postal Service operates post offices in Baton Rouge. The Baton Rouge Central Post Office is located at 750 Florida Street in Downtown Baton Rouge. Baton Rouge is the middle ground of South Louisiana cultures, having a mix of Cajun and Creole Catholics and Baptists of the Florida Parishes and South Mississippi. Baton Rouge is a college city with Baton Rouge Community College, Louisiana State University, Our Lady of the Lake College, and Southern University whose students make up some 20% of the city population. There is a sizable international population of about 11,300, the largest of which are people of Hispanic or Vietnamese descent. Due to this, Baton Rouge has come to have a unique culture as well as be a representation of many different heritages. Baton Rouge has an expanding visual arts scene, which is centered downtown. This increasing collection of venues includes the Shaw Center for the Arts. Opened in 2005, this award-winning facility houses the Brunner Gallery, LSU Museum of Art, the Manship Theatre, a contemporary art gallery, traveling exhibits, and several eateries. Another prominent facility is the Louisiana Art and Science Museum (LASM), which contains Irene W. Pennington Planetarium, traveling art exhibits, space displays, and an ancient Egyptian section. Several smaller art galleries, including the Baton Rouge Gallery, offering a range of local art are scattered throughout the city. The city has several designated arts & cultural districts, the most prominent of which are the Mid-City Cultural District and the Perkins Road Arts District. These districts provide tax incentives, mostly in the form of exempting state tax on purchases, to promote cultural activity in these areas. There is also an emerging performance arts scene. LSU's Swine Palace is the foremost theatre company in the city, largely made up of students of LSU's MFA acting program, as well as professional actors and stage managers. There is also a budding group of physical theatre and circus artists at LSU, who most recently traveled to Edinburgh, Scotland in Summer 2012 to perform Dante in the world's largest Fringe Festival. The show ran in Baton Rouge before going to Fringe, and featured movement, acrobatics, and aerial silk. The Baton Rouge Little Theater offers a diverse selection of live theatre performances. Opera Louisiane is Baton Rouge's newest and only professional opera company. The Baton Rouge Ballet Theatre is Baton Rouge's professional dance company. The Nutcracker – A Tale from the Bayou sets the familiar holiday classic in 19th-century Louisiana and has become a Baton Rouge holiday tradition. A Tale from the Bayou features professional dancers, a live orchestra and more than 300 area children. Performing venues include the Baton Rouge River Center, Baton Rouge River Center Theatre for the Performing Arts, which seats approximately 1900, the Manship Theatre, which is located in the Shaw Center for the Arts and seats 350, as well as the Reilly Theater which is home to Swine Palace, a non-profit professional theater company associated with the Louisiana State University Department of Theatre. In addition, the Baton Rouge Symphony Orchestra has been in service for 61 years, and currently operates at the River Center Music Hall downtown. Today, there are over 60 concerts annually performed by the Baton Rouge Symphony Orchestra directed by Timothy Muffitt and David Torns. The BRSO's educational component, the Louisiana Youth Orchestra, made its debut in 1984 and currently includes almost 180 musicians under the age of 20. Many events take place throughout the year. Every year Baton Rouge hosts many Mardi Gras parades, the largest one being held in historic Spanish Town. Other festivals include FestforAll, Louisiana Earth Day, Mardi Gras season, the St. Patrick's Day Parade, Bayou Country Superfest, and Red Stick International Animation Festival. The major daily newspaper is The Advocate, publishing since 1925. Prior to October 1991, Baton Rouge also had an evening newspaper, The State-Times—at that time, the morning paper was known as "The Morning Advocate." Other publications include: DIG Magazine, Greater Baton Rouge Business Report, 225 magazine, inRegister magazine, 10/12 magazine, The Daily Reveille, The Southern Review, Country Roads magazine, 225Alive, Healthcare Journal of Baton Rouge, Southern University Digest, and the South Baton Rouge Journal. Other newspapers in East Baton Rouge Parish include the Central City News and the Zachary Post. Baton Rouge also offer local Government-access television (GATV) only channels on Cox Cable. Metro 21 on channel 21, Cox 4 on channel 4, and Catholic Life on channel 15. College sports play a major role in the culture of Baton Rouge. The LSU Tigers and the Southern University Jaguars are local college American football teams. College baseball, basketball and gymnastics are also popular. Baton Rouge has a rugby team, the Baton Rouge Redfish 7, which began playing in 1977 and has won numerous conference championships. Currently, the team competes in the Deep South Rugby Union as a Division II team. It also has an Australian rules football team, the Baton Rouge Tigers, which began playing in 2004 competes in the USAFL. The city's minor-league soccer team, the Capitals, play in the PDL (USL Premier Development League). Currently, the team plays home games in Olympia Stadium. The city is also home to the National Hockey League 14 team called the Baton Rouge Blazers. There are many architectural points of interest in Baton Rouge, ranging from antebellum to modern. The neo-gothic Old Louisiana State Capitol was built in the 1890s as the first state house in Baton Rouge and was later replaced by the 450 feet (137 m) tall, art-deco New Louisiana State Capitol which was the tallest building in the South when it was completed. Several plantation homes in the area such as Magnolia Mound Plantation House, Myrtles Plantation, and Nottoway Plantation showcase antebellum-era architecture. Louisiana State University has over 250 buildings in Italian Renaissance style, one of the nation's largest college stadiums, and is endowed with many live oaks. Several examples of modern and contemporary buildings are downtown, including the Louisiana State Museum. A number of structures, including the Baton Rouge River Center, Louisiana State Library, LSU Student Union, Louisiana Naval Museum, Bluebonnet Swamp Interpretive Center, Louisiana Arts and Sciences Center, Louisiana State Archive and Research Library, and the Pennington Biomedical Research Center, were designed by local architect John Desmond. Yazoo and Mississippi Valley Railroad Company Depot, currently houses the Louisiana Art and Science Museum. Museums around town offer a variety of genres. The Louisiana State Museum and the Old Louisiana State Capitol Museum display information on state history and have many interactive exhibits. The Shaw Center for the Arts showcases and the Louisiana Art and Science Museum showcase varied arts. LASM also includes science exhibits and a planetarium. Other museums include the LSU Museum of Natural Science and the USS Kidd. Baton Rouge has an extensive park collection run through BREC (The Recreation & Park Commission for the Parish of East Baton Rouge). The largest park is City Park near LSU and is currently undergoing a complete remodeling. The Baton Rouge Zoo is run through BREC and includes 1800+ species. Louisiana State University and Agricultural and Mechanical College, generally known as Louisiana State University or LSU, is a public, coeducational university that is the main campus of the Louisiana State University System. LSU includes nine senior colleges and three schools, in addition to specialized centers, divisions, institutes, and offices. Enrollment stands at over 32,000 students, with 1,300 full-time faculty members. LSU is also one of 21 American universities designated as a land-grant, sea-grant and space-grant research center. In order to reverse decades of underfunding, the university recently launched an ambitious fundraising drive, called the "Forever LSU" campaign. Southern University and A&M College is a comprehensive institution offering two associate's degree programs, 42 bachelor's degree programs, 19 master's degree programs, and five doctoral programs. The University is part of the only historically black land grant university system in the United States. Southern became a land-grant school in 1890, and an Agricultural and Mechanical department was established. The University offers programs of study ranging from associate degree to doctoral and professional degrees. It provides opportunities for students to participate in internships and summer assignments in industry and with the federal government. Virginia College opened in October 2010 and offers students training in areas like Cosmetology, Business, Health and Medical Billing. Virginia College received senior college recognition from the Accrediting Council for Independent Colleges and Schools (ACICS) which now accredits all programs at the school's campuses. Our Lady of the Lake College is an independent Catholic institution also in the Baton Rouge medical district that offers associate's degrees, bachelor's degrees, and master's degrees in programs such as nursing, health sciences, humanities, behavioral sciences, and arts and sciences. It has an associated hospital, Our Lady of the Lake Regional Medical Center. In 2010, LSU announced that it will relocate its medical education and Hospital Services to Our Lady of the Lake Hospital in Baton Rouge as a result of a historic agreement between LSU and the training hospital. Tulane University is also opening a satellite medical school at Baton Rouge General's Mid City Campus in 2011. Southeastern Louisiana University School of Nursing is located in the medical district on Essen Lane in Baton Rouge. Southeastern offers traditional baccalaureate and masters degree programs as well as LPN and RN to BSN articulation opportunities. Baton Rouge Community College is an open-admission, two-year post-secondary public community college, established on 28 June 1995. The college settled into a permanent location in 1998. The 60-acre (240,000 m2) campus consists of five main buildings: Governor's Building, Louisiana Building, Cypress Building, Bienvenue Building (student center), and the Magnolia Library Building. The college's current enrollment is more than 8,000 students. The curricular offerings include courses and programs leading to transfer credits, certificates and associate degrees. East Baton Rouge Parish Public Schools operates primary and secondary schools serving the city. The city of Baton Rouge is also home to 15 charter schools with a total enrollment of 3800 pupils. One of the latest includes the Mentorship Academy in downtown Baton Rouge, which leverages its location downtown to establish internship opportunities with local businesses as well as provide a high tech classroom environment to focus on a digital animation curriculum. The East Baton Rouge Parish School System is the second largest public school system in the state and contains nine U.S. Blue Ribbon Schools and a nationally renowned Magnet Program. The school system serves more than 42,850 students and with the help of 6,250 teachers and faculty, the district has shown growth and increase in its District Performance Score (DPS). The East Baton Rouge Parish Library System has 13 local libraries with one main library and 12 community libraries. The library system is an entity of the city-parish government. The system has been in operation since 1939. It is governed by the EBR Parish government and directed by the Library Board of Control. The Baton Rouge Metropolitan Council appoints the eight member board and then the Board appoints a Director. According to its website, all branches are open seven days a week to assist the public with everything from reference and information to computer access. The Louisiana State Archives’ Main Research Library is located in Baton Rouge as well. It houses general history books, census indexes, immigration schedules, church records and family histories. The Library also has a computerized database of more than two million names that has various information about these people including census info, marriage info and social security filing info. Most of the Baton Rouge area's high speed internet, broadband, and fiber optic communications are provided by Eatel, AT&T Inc., Charter Communications, or Cox Communications. In 2006, Cox Communications linked its Lafayette, Baton Rouge, and New Orleans markets with fiber optic infrastructure. Other providers soon followed suit, and fiber optics have thus far proven reliable in all hurricanes since they were installed, even when mobile and broadband service is disrupted during storms. In 2001, the Supermike computer at Louisiana State University was ranked as the number 1 computer cluster in the world, and remains one of the top 500 computing sites in the world. Lane Memorial Hospital – Zachary, Louisiana. Baton Rouge is home station to the Army National Guard 769th Engineer Battalion, which recently had units deployed to Iraq and Afghanistan. The armory located near LSU three company-sized units: 769th HSC (headquarters support company); 769th FSC (forward support company); and the 927th Sapper Company. Other units of the battalion are located at Napoleonville (928th Sapper Company); Baker, Louisiana (926th MAC mobility augmentation company); and Gonzales, Louisiana (922nd Horizontal Construction Company). The 769th Engineer Battalion is part of the 225th Engineer Brigade which is headquartered in Pineville, Louisiana at Camp Beauregard. There are four engineer battalions and an independent bridging company in the 225th Engineer Brigade which makes it the largest engineer group in the US Army Corps of Engineers. Baton Rouge is also home to 3rd Battalion, 23rd Marine Regiment (3/23) is a reserve infantry battalion in the United States Marine Corps located throughout the Midwestern United States consisting of approximately 800 Marines and Sailors. The battalion was first formed in 1943 for service in the Pacific Theater of Operations during World War II, taking part in a number of significant battles including those at Saipan and Iwo Jima before being deactivated at the end of the war. In the early 1960s, the unit was reactivated as a reserve battalion. The battalion is headquartered in Saint Louis, Missouri with outlying units throughout the Midwestern United States. 3/23 falls under the command of the 23rd Marine Regiment and the 4th Marine Division. Recent operations have included tours in Iraq and Afghanistan. Baton Rouge is connected by the following major routes: I-10 (Capital City Expressway via the Horace Wilkinson Bridge), I-12 (Republic of West Florida Parkway), I-110 (Martin Luther King Jr. Freeway), Airline Highway (US 61), Florida Boulevard (US 190) (via the Huey P. Long Bridge), Greenwell Springs Road (LA 37), Plank Road/22nd Street (LA 67), Burbank Drive & Highland Road(LA 42), Nicholson Drive (LA 30), Jefferson Highway (LA 73), Louisiana Highway 1 (LA 1) and Scotland/Baker/Zachary Highway (LA 19). The business routes of US 61/190 run west along Florida Blvd. from Airline Highway to River Road downtown. The routes also run along River Rd., Chippewa Street, and Scenic Highway from Chippewa to Airline. US 190 joins US 61 on Airline Hwy. from Florida Blvd. to Scenic Hwy., where the two highways split. US 190 continues westward on Airline to the Huey P. Long Bridge, while US 61 heads north on Scenic Hwy. To accommodate the rapid growth of Baton Rouge, sections of its freeways have been upgraded in recent decades and there are currently plans to create a tolled freeway loop around the metropolitan area. According to the 2008 INRIX National Traffic Scorecard, which ranks the top 100 congested metropolitan areas in the U.S., Baton Rouge is the 33rd-most-congested metro area in the country. However, at a population rank of 67 out of 100, it has the second-highest ratio of population rank to congestion rank, higher than even the Los Angeles-Long Beach-Santa Ana metropolitan area, indicating a remarkably high level of congestion for the comparatively low population. According to the Scorecard, Baton Rouge was the only area out of all 100 to show an increase in congestion from 2007 to 2008 (+6%). The city also tied for the highest jump in congestion rank over the same period (14 places). Specific problem areas include a stretch of I-12E between the Airline Highway and O'Neal Lane exits, which extends even further to the Denham Springs exit in Livingston Parish. The S. Sherwood Forest Blvd., Millerville Road, and O'Neal Lane exits all made the list of the nation's top 1000 bottlenecks in the aforementioned INRIX study. Three lanes wide in either direction until the O'Neal Lane exit, the interstate abruptly becomes two lanes in either direction thereafter. This stretch of road, called "a deathtrap" by one lawmaker, has become notorious for traffic accidents, many with fatalities. In 2007, ten people died in traffic accidents within a three-month period on this section of road. In 2009, Governor Bobby Jindal and the Baton Rouge legislative delgation were successful in allocating state and federal funding to widen this portion of I-12 to the Range Avenue Exit at Denham Springs. The construction was completed in mid-2012 and has significantly improved the flow of traffic. In 2010, The American Reinvestment and Recovery Act provided committed federal funds to widen I-12 from the Range Avenue Exit to Walker, Louisiana. I-10W at Bluebonnet Road also ranks within the top 1000 bottlenecks for 2008, and I-10E at Essen Lane and at Nicholson Drive rank not far out of the top 1000. Though significant improvements to I-10 were made to allow for easier access to the Mall of Louisiana, the stretch of I-10 from the I-10/I-12 split to Siegen Lane, which includes the Bluebonnet exit, was not part of these improvements and remains heavily congested during peak hours. Initial work in the 87-million-dollar project to widen this segment to three lanes in both directions has begun and may take up to three years to complete. In 2010, the American Reinvestment and Recovery Act provided supplemental funding for this project to extend to the Highland Road exit in East Baton Rouge Parish. Surface streets in Baton Rouge are no stranger to severe congestion, either. However, relief is starting to be felt after years of stagnation in road upgrades. Baton Rouge Mayor Kip Holden has instituted an extensive upgrade of East Baton Rouge Parish roads known as the Green Light Plan, geared toward improving areas of congestion on the city's surface streets. With its first project completed in October 2008, it has seen numerous others reach completion as of mid-2009, with several more under construction and still others yet to break ground. A circumferential loop freeway has been proposed for the greater Baton Rouge metro area to help alleviate congestion on the existing through-town routes. The proposed loop would pass through the outlying parishes of Livingston (running alongside property owned and marketed as an industrial development by Al Coburn, a member of President Mike Grimmer's staff), Ascension, West Baton Rouge, and Iberville, as well as northern East Baton Rouge Parish. This proposal has been subject to much contention, particularly by residents living in the outer parishes through which the loop would pass. If made a reality, the project would cost approximately $4 billion and would not be completed until 2016 at the earliest. Other suggestions considered by the community are upgrading Airline Highway (US 61) to freeway standards in the region as well as establishing more links between East Baton Rouge Parish and its neighboring communities. Located 10 minutes north of downtown near Baker, the Baton Rouge Metropolitan Airport connects the area with the four major airline hubs serving the southern United States. Commercial carriers include American Eagle, United Airlines, Delta Air Lines and US Airways Express. Nonstop service is available to Atlanta, Dallas-Ft. Worth, Houston, Memphis and Charlotte. Four major rail lines provide railroad freight service to Baton Rouge. Since 2006, Baton Rouge and New Orleans leaders as well as the state government have been pushing to secure funding for a new high speed rail passenger line between downtown Baton Rouge and downtown New Orleans, with several stops in between. LA Swift provides transportation via charter bus from Baton Rouge to New Orleans (New Orleans to Baton Rouge), it also has other pick-up points in Sorrento, LA and LaPlace, LA . Price: $5 one -way and $10 round-trip. ^ "Population Estimates". United States Census Bureau. http://www.census.gov/popest/data/cities/totals/2012/SUB-EST2012.html. Retrieved 2013-10-23. ^ a b "Census shows shift | News | 2theadvocate.com — Baton Rouge, LA". 2theadvocate.com. http://www.2theadvocate.com/news/Census-shows-shift.html?index=14&c=y. Retrieved 2011-04-27. ^ a b "Top 25 Water Ports by Weight: 2004 (Million short tons)". Freight Facts and Figures 2006. Federal Highway Administration. November 2006. http://ops.fhwa.dot.gov/freight/freight_analysis/nat_freight_stats/docs/06factsfigures/fig2_8.htm. Retrieved 18 August 2007. ^ a b "About the Port". portgbr.com. http://www.portgbr.com/content/3-about-the-port. Retrieved 2011-04-27. ^ Louisiana Department of Culture, Recreation and Tourism. "Baton Rouge Historical Marker". http://www.stoppingpoints.com/louisiana/East-Baton-Rouge/Baton+Rouge/. ^ Firefly Digital, Inc., www.fireflydigital.com, 800-397-1624. "Baton Rouge Demographics : Baton Rouge Area Chamber". Brac.org. http://www.brac.org/site22.php. Retrieved 2011-04-27. ^ "Baton Rouge: History". Archived from the original on 7 May 2008. http://www.city-data.com/us-cities/The-South/Baton-Rouge-History.html. Retrieved 14 April 2008. ^ "Geography of Baton Rouge". How Stuff Works. http://geography.howstuffworks.com/united-states/geography-of-baton-rouge.htm. Retrieved 2013-06-26. ^ "Baton Rouge: Geography and Climate". Answers. http://www.answers.com/topic/baton-rouge-geography-and-climate. Retrieved 2013-06-26. ^ "NowData - NOAA Online Weather Data". National Oceanic and Atmospheric Administration. http://www.nws.noaa.gov/climate/xmacis.php?wfo=lix. Retrieved June 10, 2013. ^ "Monthly Averages for Baton Rouge Metropolitan Airport". The Weather Channel. http://www.weather.com/outlook/travel/vacationplanner/wxclimatology/monthly/BTR:9. Retrieved 2012-02-07. ^ "Austin Washington Raleigh And Boston Top 2010 Rank Of Best Cities For Young Americans – Business News". Portfolio.com. 2008-09-11. http://www.portfolio.com/business-news/us-uncovered/2010/03/15/austin-washington-raleigh-and-boston-top-2010-rank-of-best-cities-for-young-americans#ixzz0sHa3fBW9. Retrieved 2011-04-27. ^ a b "Learn". CNN. http://money.cnn.com/smallbusiness/best_places_launch/2009/snapshot/28.html. ^ "Contacts." The Shaw Group. The Shaw Group was bought by CBI in Feb. 2013. Retrieved on February 25, 2011. "Worldwide Headquarters The Shaw Group Inc. 4171 Essen Lane Baton Rouge, Louisiana 70809 USA." ^ "contact us." Lamar Advertising Company. Retrieved on February 25, 2011. "5321 Corporate Boulevard Baton Rouge, LA 70808." ^ "Port of Greater Baton Rouge". http://www.portgbr.com/content.php?display=about. Retrieved 26 April 2008. ^ "Exxon Mobil Refinery". Archived from the original on 22 December 2007. http://web.archive.org/web/20071222110653/http://www.exxonmobilchemical.com/public_pa/WorldwideEnglish/WhoWeAre/WhereWeOperate/Americas/OC_who_operate_USCAN_BatonRouge.asp. Retrieved 26 April 2008. ^ "DowChemicals". Archived from the original on 7 May 2008. http://www.dow.com/dowpromise/community/batonrou.htm. Retrieved 26 April 2008. ^ "Capitol Park". Archived from the original on 8 May 2008. http://brgov.com/dept/ddd/capitolpark.htm. Retrieved 26 April 2008. ^ "Baton Rouge Louisiana | Full Service Studio Complex". Celtic Media Centre. 2011-03-25. http://www.thecelticmediacentre.com/. Retrieved 2011-04-27. ^ "City of Baton Rouge-Parish of East Baton Rouge CAFR" (PDF). Archived from the original on 05 March 2013. http://brgov.com/dept/finance/pdf/2011%20CAFR/CAFR2011.pdf. Retrieved 2013-03-05. ^ United States Census Bureau. "Census of Population and Housing". http://www.census.gov/prod/www/decennial.html. Retrieved October 23, 2013. ^ "Annual Estimates of the Resident Population: April 1, 2010 to July 1, 2012". http://www.census.gov/popest/data/cities/totals/2012/SUB-EST2012-3.html. Retrieved October 23, 2013. ^ "Baton Rouge (city), Louisiana". State & County QuickFacts. U.S. Census Bureau. http://quickfacts.census.gov/qfd/states/22/2205000.html. Retrieved April 21, 2012. ^ "Louisiana - Race and Hispanic Origin for Selected Cities and Other Places: Earliest Census to 1990". U.S. Census Bureau. http://www.census.gov/population/www/documentation/twps0076/twps0076.html. Retrieved April 21, 2012. ^ American FactFinder, United States Census Bureau. "Baton Rouge city, Louisiana – Selected Social Characteristics in the United States: 2005–2007". Factfinder.census.gov. http://factfinder.census.gov/servlet/ADPTable?_bm=y&-geo_id=16000US2205000&-qr_name=ACS_2007_3YR_G00_DP3YR2&-context=adp&-ds_name=&-tree_id=3307&-_lang=en&-redoLog=false&-format=. Retrieved 2011-04-27. ^ Milburn Calhoun, Bernie McGovern, eds. Louisiana Almanac 2008-2009 Pelican Publishing, 2008, ISBN 978-1455607709, pp. 169-170. Excerpts available at Google Books. ^ a b c "Baton Rouge Government". City of Baton Rouge. http://brgov.com/govt/. Retrieved 2013-06-12. ^ "Metropolitan Council". City of Baton Rouge. http://brgov.com/dept/council/. Retrieved 2013-06-12. ^ "Post Office Location – MAIN OFFICE DOWNTOWN UNIT." United States Postal Service. Accessed 5 May 2009. ^ "Races in Baton Rouge on City-Data.com". Archived from the original on 18 April 2008. http://www.city-data.com/city/Baton-Rouge-Louisiana.html. Retrieved 13 April 2008. ^ "Shaw Center for the Arts". Archived from the original on 5 April 2008. http://www.shawcenter.org/. Retrieved 12 April 2008. ^ "Louisiana Arts and Science Museum". Archived from the original on 9 May 2008. http://www.lasm.org/. Retrieved 12 April 2008. ^ "Louisiana Department of Culture, Recreation and Tourism". http://www.crt.state.la.us/culturaldistricts/. Retrieved 4 May 2012. ^ "The Premier Professional Theatre of Louisiana". Swine Palace. 2012-07-18. http://www.swinepalace.org/. Retrieved 2012-11-10. ^ "LSU Department of Theatre to Present "Dante" March 27-April 6 in Movement Studio". Lsu.edu. 2012-03-09. http://www.lsu.edu/ur/ocur/lsunews/MediaCenter/News/2012/03/item44688.html. Retrieved 2012-11-10. ^ "Baton Rouge River Center". Archived from the original on 16 April 2008. http://www.brrivercenter.com/site.php. Retrieved 12 April 2008. ^ "Baton Rouge Little Theater". Archived from the original on 9 April 2008. http://www.brlt.org/. Retrieved 12 April 2008. ^ a b "Baton Rouge Symphony Orchestra". Brso.org. http://www.brso.org/. Retrieved 2011-04-27. ^ "Bayou Country Superfest". http://www.bayoucountrysuperfest.com/. Retrieved 4 May 2012. ^ "Forum with list of events". Archived from the original on 28 March 2008. http://web.archive.org/web/20080328103752/http://www.urbanplanet.org/forums/Baton-Rouge-Events-t24016.html. Retrieved 12 April 2008. ^ "Louisiana State University Sports". http://www.lsusports.net/. Retrieved 13 April 2008. ^ "Southern Jaguars". Archived from the original on 15 April 2008. http://gojagsports.cstv.com/. Retrieved 13 April 2008. ^ "Baton Rouge Rugby.net". Baton Rouge Rugby.net. http://www.batonrougerugby.net/. Retrieved 2011-04-27. ^ "Premier Development League". Pdl.uslsoccer.com. Archived from the original on 10 May 2011. http://pdl.uslsoccer.com/. Retrieved 2011-04-27. ^ "Louisiana State University". Archived from the original on 24 May 2008. http://en.wikipedia.org/wiki/Louisiana_State_University#Campus/. Retrieved 14 April 2008. ^ "Louisiana State Museum". Archived from the original on 13 April 2008. http://www.225batonrouge.com/places/louisiana-state-museum/. Retrieved 14 April 2008. ^ "News | Architect Desmond dies — Baton Rouge, LA". 2theadvocate.com. Archived from the original on 22 May 2011. http://www.2theadvocate.com/news/17120296.html. Retrieved 2011-04-27. ^ "LOUISIANA ART AND SCIENCE MUSEUM". www.lasm.org. Archived from the original on 5 June 2008. http://www.lasm.org. Retrieved 29 May 2008. ^ "The Recreation and Park Commission for the Parish of East Baton Rouge". Archived from the original on 9 April 2008. http://www.brec.org/. Retrieved 14 April 2008. ^ The Associated Press (2010-01-25). "LSU reaches agreement with Baton Rouge hospital; will close Earl K. Long". NOLA.com. Archived from the original on 22 May 2011. http://www.nola.com/politics/index.ssf/2010/01/lsu_reaches_agreement_with_bat.html. Retrieved 2011-04-27. ^ "Tulane University – Tulane University, Baton Rouge General Affiliate for Medical School Training Campus". Tulane.edu. http://tulane.edu/news/releases/pr_03032010.cfm. Retrieved 2011-04-27. ^ "Baton Rouge Area Education". http://www.brac.org/site27.php#public. Retrieved 5 June 2008. ^ Pennington Biomedical Research Center. Pbrc.edu. Retrieved on 2013-07-29. ^ "Inside Report for May 11, 2010 | Opinion | 2theadvocate.com — Baton Rouge, LA". 2theadvocate.com. http://www.2theadvocate.com/opinion/93368859.html?showAll=y&c=y. Retrieved 2011-04-27. ^ East Baton Rouge Parish School Board. Ebrschools.org (2012-07-23). Retrieved on 2013-07-29. ^ About the Library. EBRPL.com. Retrieved on 2013-07-29. ^ Louisiana State Archives and Libraries. Statearchives.us. Retrieved on 2013-07-29. ^ ":: Baton Rouge Business Report :: Dueling strands of fiber optics". Businessreport.com. http://www.businessreport.com/news/2010/apr/05/dueling-strands-fiber-optics-tchn1/. Retrieved 2011-04-27. ^ "View source – Wikipedia, the free encyclopedia". En.wikipedia.org. http://en.wikipedia.org/w/index.php?title=Baton_Rouge,_Louisiana&action=edit&section=26. Retrieved 2011-04-27. ^ "LSU CAPITAL's Supercomputer". Phys.lsu.edu. http://www.phys.lsu.edu/faculty/tohline/capital/beowulf.html. Retrieved 2011-04-27. ^ Seymour Cray. "SuperMike | TOP500 Supercomputing Sites". Top500.org. http://www.top500.org/system/details/6084. Retrieved 2011-04-27. ^ "Geaux fiBR – Thinking BIG with a GIG in Baton Rouge". Geauxfibr.com. http://www.geauxfibr.com/. Retrieved 2012-11-10. ^ "INRIX National Traffic Scorecard". Scorecard.inrix.com. http://scorecard.inrix.com/scorecard/Top100Metros.asp. Retrieved 2011-04-27. ^ "INRIX National Traffic Scorecard". Scorecard.inrix.com. http://scorecard.inrix.com/scorecard/MetropolitanDetails.asp?ID=33. Retrieved 2011-04-27. ^ "I-12 accidents piling up". 2theadvocate.com. http://www.2theadvocate.com/news/8124837.html. Retrieved 2011-04-27. ^ "More funds sought for I-12 widening project". 2theadvocate.com. http://www.2theadvocate.com/news/46588277.html. Retrieved 2011-04-27. ^ "I-12 work to begin". 2theadvocate.com. http://www.2theadvocate.com/news/44106607.html. Retrieved 2011-04-27. ^ "Project on I-10 to begin". 2theadvocate.com. http://www.2theadvocate.com/news/37052144.html. Retrieved 2011-04-27. ^ "Geaux Wider". Geaux Wider. Archived from the original on 15 March 2011. http://www.geauxwider.com/. Retrieved 2011-04-27. ^ "The Green Light Plan". Greenlight.csrsonline.com. http://greenlight.csrsonline.com/. Retrieved 2011-04-27. ^ "Poll shows public support for loop". 2theadvocate.com. 2009-05-12. http://www.2theadvocate.com/news/44842827.html. Retrieved 2011-04-27. ^ "Facts about Baton Rouge". Brgov.com. Archived from the original on 8 June 2011. http://brgov.com/dept/planning/facts.htm#Top. Retrieved 2011-04-27. ^ The Associated Press. "Louisiana to seek New Orleans-Baton Rouge passenger rail line from federal stimulus pot that Jindal called wasteful". NOLA.com. Archived from the original on 10 May 2011. http://www.nola.com/news/index.ssf/2009/02/louisiana_to_seek_new_orleansb.html. Retrieved 2011-04-27. ^ "Sister-city agreement finalized | News | 2theadvocate.com — Baton Rouge, LA". 2theadvocate.com. 2010-04-13. http://www.2theadvocate.com/news/90777559.html?utm_source=twitterfeed&utm_medium=twitter. Retrieved 2011-04-27. This page uses content from the English language Wikipedia. The original content was at Baton Rouge, Louisiana. The list of authors can be seen in the page history. As with this Familypedia wiki, the content of Wikipedia is available under the Creative Commons License.